Natasha Jonas's website declares her ambition succinctly and clearly for all to see: "Win gold at the London 2012 Olympics." After years of sweat, bloodied noses and swollen eyes, Jonas is edging closer to that landmark aspiration as Great Britain's representative at the one and only Olympic qualifier ahead of two of the country's other leading lightweights. But boxing is as much about mental toughness as it is physical prowess - bouts can be won or lost before a fighter even sets foot in the ring - and the Liverpudlian southpaw knows all about that. "For me personally, boxing is 90% mental, 10% physical," Jonas told BBC Sport from her adopted home in Sheffield, GB Boxing's headquarters. "There's the challenge of having to make weight, the constant pressures to perform and the competitiveness within camp before you've even got to the competition - there were two other girls at 60kg and I had to be the one to get selected to even get to the qualifiers." As part of Britain's Olympic boxing set-up, Jonas has worked with sports psychologists to ensure her mind is every bit as sharp as her left hook. "I'm definitely more professional. There's no more 'I can't', it's all about 'I will'," she said. "I don't think 'I'm tired' or 'my legs are sore'. Instead, I'll think, 'They might be a bit tired but it's alright, I can do it'. I feel physically better because of it." Her results in recent months illustrate that fact. A European bronze medal back in October was followed by a gold at the Olympic test event a month later, beating the world number two in the process. As a consequence, she was chosen for Britain's sole lightweight spot at this month's World Championships in China, ahead of Amanda Coulson and Chantelle Cameron, and she will have the chance to make history by qualifying for the first ever Olympic women's boxing event. "Everything's been going my way this year," said Jonas. "Now that I've finally got the decision I feel like a big weight has been lifted off my shoulders. I had to go into every competition with the mindset that the better the medal I win, the better my chances (of being selected)." It's taken two long years for Jonas to get to that position, constantly assessing her character, continually judging her happiness. "I've always been one to walk around with a smile on my face, but sometimes that smile would be a mask for something else, something deeper," she said. "I've had to fight a few demons. I've had to break habits. Now, everything bounces off me. There's always a positive to every negative. "I did a lot of work with the psychologist about personalities. Not that I'm a schizophrenic with loads of different personalities but people have little bits of different characters. I've got 'the greedy kid' and 'the professional'. "With 'the greedy kid' I say to myself, 'I'll just run it off' or 'I'll do it tomorrow.' But when I'm 'the professional' I say, 'I don't need that so I'll kick it to the side.'" 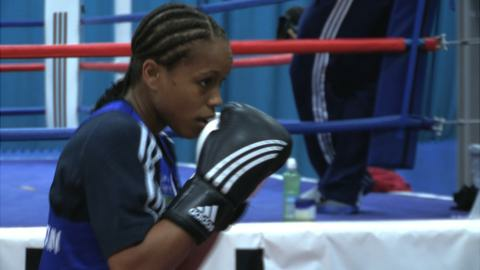 When women's boxing was chosen to join the Olympic programme in 2009, Jonas was four kilograms heavier than she is now. Originally one of the top five 64kg light-welterweights in the world, she decided to drop weight and compete at lightweight, one of the three Olympic divisions. "Last year my weight was a big issue," said Jonas, who now has her weight constantly checked by sports nutritionists. "Yo-yo dieting was affecting my performance, which meant I didn't earn any medals, which in turn was putting stress on me for the selection race. "I've had to tell myself I don't actually need that bar of chocolate. This year, my weight has been spot on. Little things like that make a big difference mentally." Now that Jonas has pushed herself to the limit in preparation, her next challenge awaits. She must finish among the top three Europeans in her weight division at the World Championships to guarantee a place in the Olympic ring when the bell rings on 5 August. "I want to do it for myself, but I also want to do it for the two girls that didn't get to go," she said. "I feel like I owe them."